Toho hasn't produced a new Godzilla movie in over a decade but they're not about to let America take over the world's favourite kaiju. To date, the studio has produced 28 of the previous 30 Godzilla movies (you can figure out the two they didn't produce) and they're getting back on the bandwagon with their own reboot of Godzilla with Godzilla Resurgence. 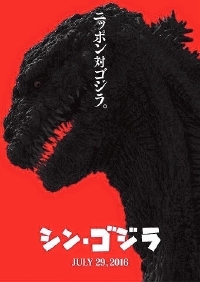 Co-directed by Hideaki Anno and Shinji Higuchi, both of whom collaborated on the anime "Neon Genesis Evangelion," this new version is determined to be the biggest, baddest Godzilla to date. Not only is he the largest version of Godzilla yet, surpassing even Legendary's version, but he's not completely digital. The movies' effects team has used a combination of puppets, animatronics, and digital effects along with a suit which will was operated by three people! Yup, man-in-suit alive and well! I've always had a soft spot for the Toho films and this one looks to be a throwback to the Godzilla movies of the past. There's certainly room in this world for the glossy Hollywood versions and the more traditional approach which is so beloved by fans. Godzilla Resurgence is scheduled to open in Japan in July and hopefully, we'll eventually get to see it in North America.